The Department of State charges extra for a passport card, and you still must have a passport book if you are going to fly to an international destination, so you might think that you don’t need the passport card. Trust me, get one anyway. Get a passport card for all those non-official uses of your passport when you travel, like checking into hotels. Officially, all you need your passport for is for border crossings. But in fact you will need your passport every time you check into a hotel in another country. 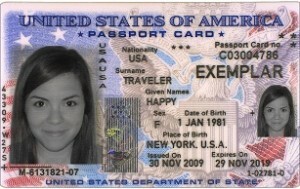 When the hotel desk clerk asks for your passport, simply smile and hand them your passport card. As I write this, I have been traveling around Europe practicing my language skills for the past two months. I’ve stayed a lots of different hotels, and every time a hotel clerk asks for my passport, I hand them my passport card, and no one has ever balked. Having a passport card also gives you a quasi-official backup passport. Keep your passport card and your passport book in separate places when you travel, and if you lose one, hopefully you will still have the other one. So get a passport card because it will make your travels slightly easier. I never thought of using the passport card for check in at hotels! What a great idea! I always carry it (hidden in a different place from my booklet) when traveling abroad in case I lose my booklet and have to go to the embassy for a replacement, but I never thought to use it for anything other than that. Thanks for the idea. It is also a form of government-issued ID that you can conveniently carry that does not have your address on it if you are concerned about preserving your privacy. Looking to learn Berber for Morroco. Arabic as a backup,and French as a last resort. Thanks for inquiring with Language101.com. Although we do not offer Berber nor Arabic (this one coming eventually) we do offer French!